Chathura obtained his BSc Computer Science (1st class honours) degree at University Of Essex. Soon after he was awarded the University Of Essex Scholarship for his PhD at the School of Computer Science and Electronic Engineering (CSEE), University Of Essex. Currently he is a staff scientist at InterDigital International Labs and a visiting fellow at the University of Essex. He works on various UK and EU projects, and was also involved in successful EU Horizon 2020 research grant proposal for project iCIRRUS. He has held program committee memberships on several occasions. He had deployed and managed a Mobile Cloud testbed used for research and for teaching newly introduced MSc Cloud Computing course at CSEE, University of Essex. To view the testbed that I have developed for research during my PhD click here. ﻿- iCIRRUS (European Union Funded) (intelligent Converged network consolidating Radio and optical access aRound USer equipment). Grant amount: around €4M, 1 Jan. 2015 - 31 Dec. 2017- Grant proposal co-author and Research Associate. 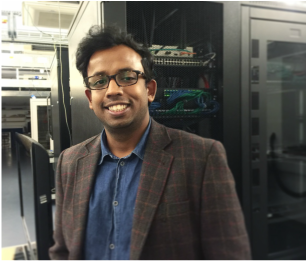 - UK EPSRC (Engineering & Physics Science Research Council) funded project NIRVANA (Intelligent, Heterogeneous Virtualised Networking Infrastructure). Grant amount: around €1M, Oct. 2014 - 30 Sep. 2017 - Research Associate. - EU (European Union)-funded FP7 Project CLIMBER (Cross-Layer Investigation and Integration of Computing and Networking Aspects of Mobile Social Networks). - Research Associate. - EU (European Union)-funded FP7 Project MONICA (Mobile Cloud Computing: Networks, Services and Architecture). - Research Associate. - IEEE Intercloud : Organized under the IEEE Standards Association Industry Connections Program, and jointly sponsored by the IEEE Cloud Computing Initiative, the IEEE Cloud Computing Standards Committee, and the IEEE Standards Association. The IEEE Cloud Computing Standards Committee is sponsoring the development of technical standards (including IEEE P2302) for cloud to cloud interoperability. The objective of the IEEE Intercloud Testbed Project is to create a global lab to prove and improve the Intercloud technology and provide a springboard for the Intercloud to become a commercial reality. - Member and POC for Essex. - OpenAirInterface (OAI) : Individual and Alliance Member. - A windows USB minifilter driver for blocking unauthorised devices (Commercialised by Conseal Security Ltd. UK). - Cooperative Intelligent agents that eats and explores to survive in a simulated world - Youtube - Description. - Program Committee member of The Fourth International Conference on Fog and Mobile Edge Computing (FMEC 2019), Rome, Italy. - Program Committee member of 10th IEEE International Conference on Cloud Computing Technology and Science (CloudCom 2018), Cyprus. - Program Committee Member of First IEEE International Workshop on Smart network Technologies and Edge computing for the Tactile Internet (STET 2018), IEEE NetSoft 2018, Montreal, Canada. - Program Committee member of The Third International Conference on Fog and Mobile Edge Computing (FMEC 2018), Barcelona, Spain. - Program Committee member of 9th IEEE International Conference on Cloud Computing Technology and Science (CloudCom 2017), Hong Kong. - Program Committee member of ACM SIGCOMM 2017 Workshop on Mobile Edge Communications (MECOMM’2017), ACM SIGCOMM 2017, UCLA, CA, USA. - Program Committee member of International Workshop on Information Centric Fog Computing (ICFC), IFIP Networking 2017, Stockholm, Sweden. - Program Committee member of IEEE 5th International Workshop on Cloud Computing Interclouds, Multiclouds, Federations, and Interoperability, IC2E 2016 - Berlin, Germany. - Program Committee member of IEEE 4th International Workshop on Cloud Computing Interclouds, Multiclouds, Federations, and Interoperability, IC2E 2015 - Tempe, Arizona, USA. - Program Committee member of IEEE Third International Workshop on Cloud Computing Interclouds, Multiclouds, Federations, and Interoperability, IC2E 2014 - Boston, USA, March 11, 2014. - Device disintegration work has been presented at MWC 2018, Barcelona. - Poster presentation, iCIRRUS: intelligent Converged network consolidating Radio and optical access aRound USer equipment, Nathan. J. Gomes, Huiling Zhu, Philippos Assimakopoulos (University of Kent & Communications Research group, United Kingdom), Anthony Magee (ADVA Optical Networking, United Kingdom), Volker Jungnickel (Fraunhofer Heinrich Hertz Institute & Technische Universität Berlin, Germany), Michael Parker, Chathura Sarathchandra Magurawalage (University of Essex, United Kingdom), EuCNC 2015, Paris, France, July 1, 2015. - Visited Key Laboratory of Universal Wireless Communications of Ministry of Education, BUPT, Beijing, China. - Visited Grid Computing and Computer Security Laboratory, Jilin University, China.